I’m hardly an expert baker, but I got a wild impulse on a recent rainy Saturday to try baking some pretty pink macarons (without any macaron cookbooks, naturally). The results were not what you’d call a success — although they tasted good — but my failure has inspired me to do some more macaron research and try again. 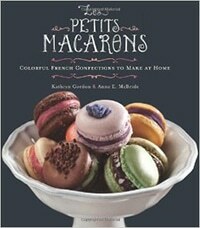 If you want to learn to make these airy pastel confections, start with these beautifully photographed macaron cookbooks. And don’t forget this adorable macaron sticky note set , so you can flag recipes and make notes while you work! Ladurée may be the most famous name in macarons. The legendary Parisian patisserie has a few North American locations (including a soon-to-open store in Vancouver, B.C. ), but if you can’t get to one of their shops, you can drool over the luscious pictures of their 80 varieties, including metallic macarons and “designer” macarons named after top fashion designers. Step-by-step instructions, cookie and filling recipes, and photos are included if you want to give them a run for their money. 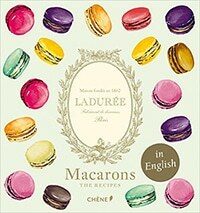 As someone who winces when people confuse “macarons” and “macaroons,” I appreciated that this book made a special note of the correct spelling and pronunciation right at the front. The attention to detail continues with a helpful table breaking down how baking times should be adjusted by macaron size. Learn the basics of the French, Swiss, and Italian methods, then go wild with flavors, colors, and rich fillings. You’ll learn how to make everything from classic chocolate and pistachio to exotic savory flavors like foie gras with black currant or duck confit with port and fig. Finally, I can have an all-macaron meal! 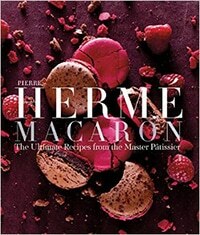 Pierre Hermé is another legend of the macaron scene, and this book claims to be the definitive guide to macarons. In addition to gorgeous fashion-spread photos of the colorful cookies, you’ll find recipes for many of their iconic flavors, from wasabi cream and strawberry to hazelnut and asparagus, plus a removable step-by-step guide to the techniques. Not much of a baker? This one is pretty enough to display on your coffee table while you munch on store-bought macarons. I won’t tell. Authors: Julia C., Tania C.
Well, here’s the one I need, unfortunately: the troubleshooting guide to fixing your craparons. Actually, I found the cover photo reassuring, with its pictures of disastrous cookie fails — flat ones, lumpy ones, overbaked ones, underdone ones. If you’re frustrated by this notoriously difficult-to-master sweet, this book offers tips on technique, baking environment, oven conditions, and photos showing the authors’ own challenges. 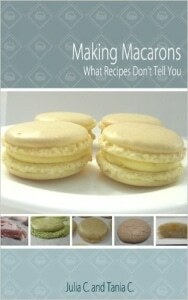 This ebook may not be as glamorous as the French bakery cookbooks, but it has a lot of good information to help you troubleshoot your macarons. Don’t give up!